Michelle Obama got a video surprise Tuesday from her husband. The former first lady appeared at a women's conference in Philadelphia. She was in the middle of a question and answer session with TV producer/screenwriter Shonda Rhimess when Rhimes suddenly told her, "I have a little bit of a surprise," and then called for a video. "Hey Honey," came a familiar voice, and the audience erupted in applause as former president Barack Obama appeared on video screens in the auditorium. "I had to crash this party," Mr. Obama said, "because today we have been married 25 years. The idea that you would put up with me for a quarter of a century is a remarkable testament to what a saintly, wonderful, patient person you are." 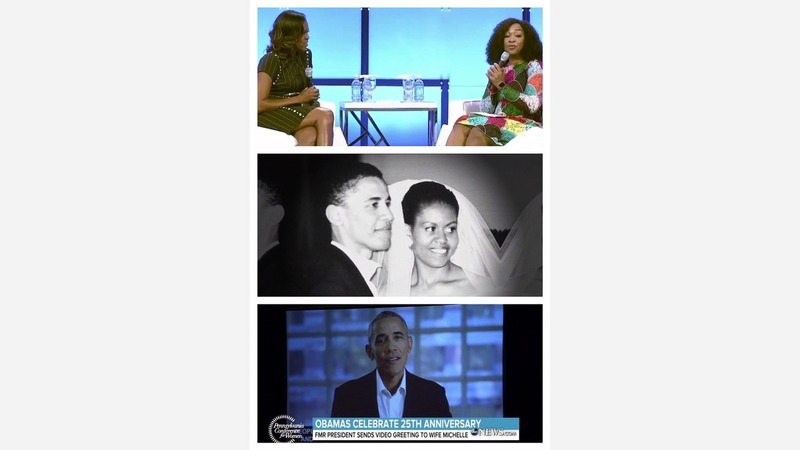 As Mrs. Obama beamed, the former president went on to praise his wife for being an "extraordinary partner," "a great friend," and an example to their daughters and to the entire country. "Your strength, your grace, your determination, your honesty -- the fact that you look so good doing all this -- the way in which you've always taken responsibility for your own actions but also looking out for the people around you is remarkable," Obama said. "And it's no wonder that as people got to know you as I got to know you that they fell in love." He went on to say that his being persistent enough to keep asking Michelle out for a date was "truly the best decision I ever made." After the two-minute video ended, Mrs. Obama blushed, smiled, then told the audience, "I'd better get home!"